Are You Ready for the 55 Plus (aka Summer Camp for adults) community! Moving to a 55 Plus Community can change your life…..the ones I have seen are seriously like an over the top Summer Camp for Adults with events going on seemingly all the time. Even if you have a hard time meeting people, joining one of their many clubs and participating should make a huge difference in your social life. There are a lot of communities here in the Triangle with prices for one level (or two level) living, starting in the mid 300’s and heading to a million plus. Fendol Falls, is one of the newer communities. Lennar is the builder and they have streamlined the process of options, to make choices easier, you get a few pre matched choices…packages, so heads up on this…the package you want may be the more expensive one 🙂 Lennar is doing this for all their communities and my clients have been frustrated that the colors they want are included in the most expensive package. Another downside to it, is really don’t we all want to mix and match, with Lennar, you are stuck with their package choices…works for Lennar, as they buy in bulk…..but we are not sheep and we all don’t want the same thing, right? (thanks for letting me get on my soap box) lol. At any rate, this is a community is a great setting in the Triangle, so let me know when you are ready to look at it. Nearby is Carolina Arbors. I have a lot of clients living in this community. Its relatively new and hasn’t grown in yet so looks pretty stark, however, the homes are lovely and there is a lot to do within the community. DelWebb is the builder. 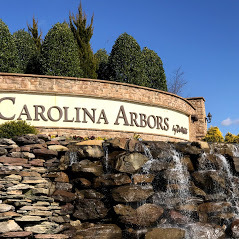 The entrance is gorgeous with its waterfall and nearby is Briar Creek Shopping, Glenwood Ave, Freeways and of course Angus Barn. DelWebb also built Cary’s Carolina Preserve. Located in Cary, and it sits partially in Wake and Chatham Counties. There is a huge clubhouse and some pretty incredible amenities as well as what feels like hourly events. Resort living year round! Heritage Pines in Cary, doesn’t have that same ‘gated’ feeling like some of the other communities. Its in Cary and has single-family homes and one-story homes. Again lots going on in this socially active community. Older homes built in early 2000, with quick access to shopping, airport, restaurants and has some cute walking trails along with their pool and clubhouse, tennis and bocce ball, and shuffleboard courts. I like this community, its quite charming. Low maintenance as the Courtyards at O’Kelly Chapel pretty much take care of exterior. Relatively new 55+ community in Cary with pricing around 400-500K. Its an easy drive to Southpoint Mall, close to Hwy 55, the new Whole Foods, restaurants, dining and shopping. There is a clubhouse with a multi-purpose room, catering kitchen and great exercise room along with its lovely pool, walking trails. Woodhall is in Cary, North Carolina.The community is being built around a large park which includes a green space and gazebo Plans include walking trails past lovely ponds. The builder is Stanley Martin. Homes will range in size from approximately 1,689 to 4,155 square feet and some offer three-car garages. Planned community events. Nearby are grocery stores, The Streets at Southpoint and Parkside Town Commons, both malls offer dining, entertainment and shopping. If you want to work out, join the nearby UNC Wellness Center – Cary, or YMCA both just a few minutes from the community. Close to hospitals as well. Another 55 plus community in Cary, NC. offering single-family or attached homes. Whats cool about Blakeley is you can live there and share your home with people of any age. The community features a more natural look with mature trees and scenic ponds. HOA maintains the homes exterior as well as lawn care. There will be approximately 137 homes in this community when its finished (Lennar/CalAtlantic builders). Main floor owner suites, and two car garages are the norm with homes up to approximately 3100 square feet. With only 50 single family homes, this is one of the more intimate 55+ communities in Cary. The plus is there are 6 different floorplans to choose from with main floor owner’s suites,and the beloved open floorplan. Nearby, freeways, shopping and dining as well as entertainment venues. Great location with nearby trails (greenways) parks, medical facilities, like Rex Hospital, Wake-Med Cary Hospital, UNC Healthcare, and Duke Medical Center. Del Webb Carolina Gardens is going up in Fuquay-Varina, south of Cary. 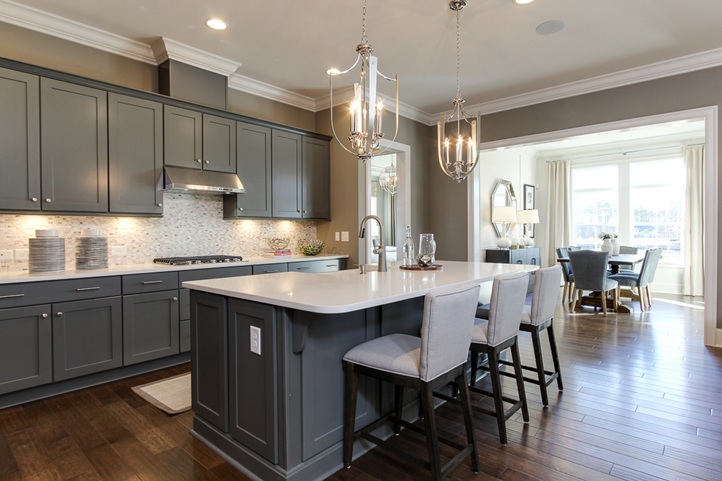 It will be similar to other Del Webb communities with approximately 10 home designs (plus different exterior elevations) There will be the usual cast of characters, like the 20,000 square-foot clubhouse, amenity area with will be the gathering area for residents. Clubs will be overseen by a full time ‘lifestyle director’ Included is an outdoor pool, tennis, bocce, pickleball courts. courts for a friendly game of pickleball, tennis, or bocce ball courts as well as walking/running/biking trails. Nearby are grocery stores, Fuquay Varina’s charming main street, restaurants, entertainment. Golf courses near this community include Bentwinds, Eagle Ridge and Reedy Creek . plus a LOT of parks. Top hospitals and medical centers, including WakeMed Cary Hospital and Johnston Health Clayton. With 540 freeway being built on the southern end of the Triangle, getting around to Raleigh, Durham, Cary, the airport etc is a lot easier. And yes there is plenty of shopping, dining etc in downtown Wake Forest and nearby, plus easy access to highways, Capital Blvd to Raleigh and medical facilities. There are a lot more 55 plus communities in this area. I wanted to highlight a few areas though. When you are ready to start your house hunt or just want some advice about how to start, give me a call. Always happy to help you find a great place to call home!